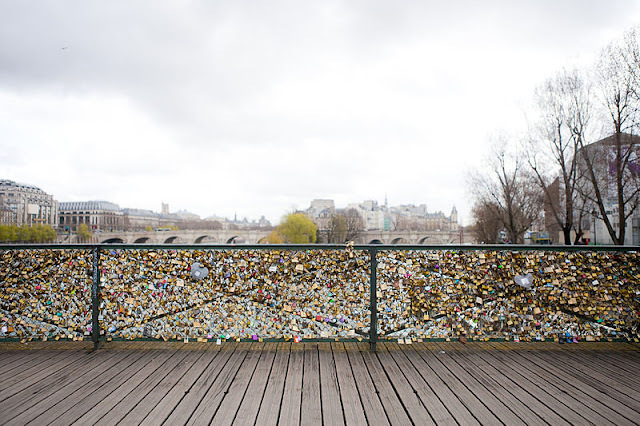 Paris, France is an amazing place many lovers go and experience the magic of the city of love, but one of the most famous tourist traditions has been put on hold for the Pont Des Arts Bridge famous of the love locks lovers lock on the bridge is no more. For the bridge famous for love can no longer bare the weight of people’s love locks. Which has many lovers disappointed over this fact for they were not about to put their on locks on the bridge and lock in their love. The Pont des Arts Bridge was built in 1801 and orders from Napoleon. The bridge is crosses over the Seine River. The bridge is not the same as it is today, for when first build it was an iron bridge which was the first one in France. The bridge was damaged from bombings during WWI, WWII, and boats colliding into it. The current Pont des Arts Bridge which was built identically from the first was made from steel. The Bridge is now a spot for art show. The Love lock mystery in Paris is believed to have started in 2008 when couples travel to Paris and arrive to the bridge and engraved their names onto the locks placing it anywhere on the bridge and throws the key into the river. This show of love continued on tell June of 2015 when the city had the panels where most of the locks were on the bridge remove, for the weight of the locks where destroying the panels and causing a safety problem for the bridge was not made to hold the amount of weight all the locks added up to which was about forty tons. The city is now replacing the panels with glass with artist drawing. Now the bridge is used to have art shows. Love Locks are not just popular in Paris but many places in the world and the city were the love lock trends is have made the locks in to a piece of art work, for example in Moscow, Russia the locks are attached on a man-made metal tree, and Toronto, Canada there are heart shaped sculptures couples can put their padlocks, so that they want put it on the Humber Bay Arch Bridge. “PONT DES ARTS BRIDGE” NAPOLEON.org, http://www.napoleon.org/en/magazine/places/pont-des-arts-bridge/. Accessed 11 Oct. 2016. CBS This Morning. “Paris removes “love locks” over weight fears.” YouTube, 1 Jun. 2015, https://www.youtube.com/watch?v=d7xxHXioddI. Fouquet Helene., and Mark Deen. "Locked and overloaded; Parisian bridges threatened by weight of countless 'love locks' left on railings." The Gazette (Montreal), 10 June. 2014, http://www.lexisnexis.com.ezproxy.usca.edu:2048/hottopics/lnacademic/. Accessed 7 Oct. 2016. Key, Derek. Pont Des Arts, Paris. 9 April. 2013, Commons. Wikimedia, https://commons.wikimedia.org/wiki/File:Pont_des_Arts,_Paris_9_April_2013.jpg. Rendón, Frankie. “Love Locks: The History and Appeal” The Huffington Post.com, 28 Aug 2016, http://www.huffingtonpost.com/frankie-rendon/love-locks-the-history-an_1_b_8056154.html/. Accessed 11 Oct. 2016. A website that promotes the custom of placing lovelocks on landmarks.